Our staff will come and collect your flyers at your place of business, discuss your needs and suggest the most effective way, dates and locations to distribute your flyers. On the distribution date, our distribution team arrives at your chosen locations at the times agreed and begins to hand out your flyers as per your instructions. For no additional cost, our distributors can use your branded clothing and uniforms as we believe when delivering we are promoting your business- not ours. However should you not have these readily available our staff will wear our bright yellow t-shirts and jeans clearly branded “The Flyer Distribution Company”. This is to enhance the visibility of the team in high traffic. All our team members are carefully selected and trained to ensure they give the best impression of your business- we are always clean, courteous and polite - even when people refuse our flyers! We will then inform you when distribution commences and ends via SMS or Whatsapp. We are more than happy to have you come check up on us - all to give you - the client - reassurance that your distribution is being done. How do we guarantee reliability? 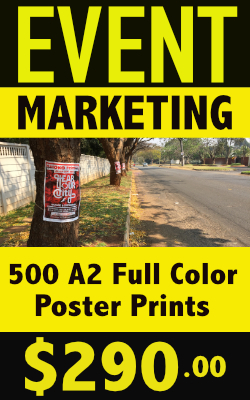 We limit the amount of work each distributor does to between 250 and 500 flyers per day. This ensures that our distributors are always energetic and ready to work. We would rather spread the risk across 5 distributors than just one distributor delivering 2000 flyers (and possibly binning them or dishing them out as quickly as possible to the easiest people they can find). In this way, if we find a ‘problem distributor’ we can pick them out of the system whilst minimizing damage. On average traffic lights in Harare stops traffic for 2 -3 minutes. This allows our distributor to step off the pavement between 160 to 200 times per 8 hour working day. Our target is to get 3 - 5 drivers to take a flyer at each light change. Therefore, each distributor can hand-out between 300 - 500 flyers per day dependent upon traffic flow, intersection and location. Please Note: Our distributors do not force flyers onto drivers and behave courteously at all times. They are also encouraged to hand out only one flyer per vehicle and are advised not to give flyers to combis, taxis, trucks and buses unless instructed to do so by the client. 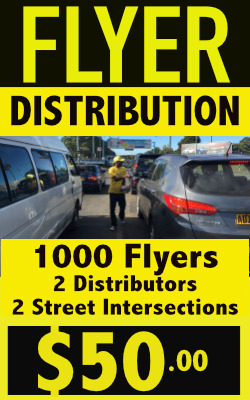 In the event of an intersection not being conducive to flyer distribution on a particular day e.g due to traffic lights not working, we may after consultation with the client, move distributors to a better location and continue with the distribution.